Three borderless musicians mixing jazz with classics, Swedish folk music and klezmer. Bach, Mingus, Monk, Fauré, Quincy Jones… This program has scored success in jazz clubs as well as concert venues i France, Italy and Sweden. How do you combine a love for classical music with an urge to express yourself in jazz? Are there similarities? What are the differences? Composed versus improvised music. Which was first, the chicken or the egg? 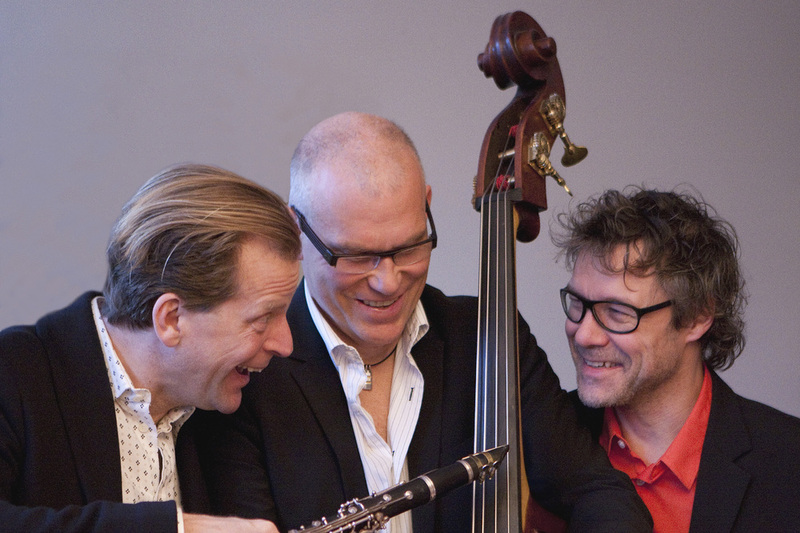 In 2009, three musicians met by chance on a jazz gig, clarinetist Staffan Mårtensson, pianist Lennart Simonsson and bassist Jan Adefelt. Although from different musical backgrounds, they found themselves united in the search for an expression without borders, combining the notated and the improvised. Since then they are happily exploring the art of improvisation together; sometimes in stricter forms, sometimes completely free. Classical masters meet jazz giants, Swedish folk meets Klezmer. Original compositions and adaptations. We strive to present this in our musical language. Three independent voices, three dialects. We think of chamber jazz as a musical conversation in real time. Staffan Mårtensson, principal clarinet of the Stockholm Royal Opera Orchestra, conductor. Winner of Swedish Grammy, plays with orchestras from Vienna, Prague, Paris, Stuttgart, Lausanne, as well as with jazz groups or string quartets. Former Artistic Director of the Summer Night Concerts at Nationalmuseum in Stockholm and present Artistic Director of the Östergötland Music Days. Lennart Simonsson, jazz pianist, composer and teacher. Has performed in a variety of venues worldwide, ranging from the Stockholm City Theater to the David Letterman Show with Elvis Costello. Regular member of the Trio X of Uppsala. Jan Adefelt, one of Sweden’s most sought-after jazz bassists for radio, TV and studio recordings. Has toured with leading swedish jazz stars such as Monica Zetterlund, Alice Babs, Putte Wickman and Anders Widmark. Teaches at the Royal College of Music in Stockholm.